The Hollywood Chamber of Commerce honored AMERICA with the 2,459th star on the Hollywood Walk of Fame and the Grammy Award-winning duo is celebrating Grammy Week in big style. America were inducted into the Hollywood Walk of Fame on Monday, February 6, just outside the Musicians Institute at 6752 Hollywood Boulevard, in the company of the Walk of Fame stars of Al Jolson, Hal David, Rush, Motley Crue, Ozzy Osbourne and Journey. 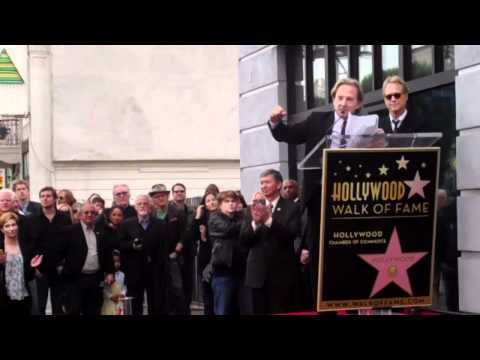 Emcee Leron Gubler, President/CEOHollywood Chamber of Commerce and guest speakers John Stamos and Billy Bob Thornton helped unveil the Walk of Fame star in the category of Recording. On Tuesday, February 7, the Best New Artist Grammy winners of 1972--known for iconic hits like “Ventura Highway,” “Sister Golden Hair,” “Horse With No Name” and “Tin Man,” among many others-- performed downtown at Los Angeles’ Grammy Museum, where they treated the crowd to classic hits and a Q&A session with the intimate audience. AMERICA is an American popular music duo consisting of singer/songwriter/guitarist Gerry Beckley and Dewey Bunnell. They met--along with Dan Peek who left the group in 1977 and passed away last year (2011)--while high school students whose fathers were stationed at an Air Force base in England. The group had instant success with their first, self-titled release, which hit #1 on the U.S. charts and went platinum on the strength of “Horse With No Name,” their first #1 hit single. They won the “Best New Artist” Grammy in 1972 and began a relentless career as touring musicians. Throughout their career, they released 16 studio albums, and had massive hits with the #1 song “Sister Golden Hair,” “Tin Man,” “Lonely People,” “I Need You,” “Don’t Cross The River” and “You Can Do Magic.” Beginning in 1974, America started working with longtime Beatles producer George Martin, for a total of six albums. They continue to perform more than 100 live shows a year and in 2011 released the Back Pages CD, America’s interpretations of some of their favorite songs. It is a rich, joyous collection of a dozen glimmering interpretations of songs by Bob Dylan, The Buffalo Springfield, Simon and Garfunkel, the Beach Boys, Jimmy Webb, Mark Knopfler as well as Fountains of Wayne, New Radicals and Gin Blossoms, among others. Upon hearing AMERICA’s version of his song “Caroline No” by the Beach Boys, Brian Wilson said: "An absolutely stunning version...I almost got tears." The album offers a fresh take on timeless songs and proves that, for all of their own rich history, America still has the ability to surprise and enchant us. As one of the most beloved groups in the history of pop continue their aggressive tour schedule, they maintain a large and devoted fan base. Beyond their hectic recording and touring duties, America find time to perform for various charities including Artists For The Arts Foundation, Prostate Cancer Foundation, Keep Memory Alive Foundation for Alzheimer Research. Other charities include: Walk Against Cancer, DART (“Dana’s Angels Research Trust”), to help raise funds for research and studies to find a treatment for victims of Niemann-Pick Type C disease (NP-C). The Tsunami charity single, "Grief Never Grows Old," performed by various artists under the name “One World Project” to benefit victims of the 2004 Indian Ocean Tsunami Disaster, also included singers: Sir Cliff Richard, Boy George, Steve Winwood, Gary Moore, Bill Wyman, Russell Watson, Kenny Jones, members of the Bee Gees, Brian Wilson & members of the Beach Boys, America, Chicago, Rick Wakeman & Jon Anderson. Released in February 2005, the single reached #4 on the U.K. charts. They gave a Benefit concert for schools/education in Soweto, Johannesburg, South Africa (November 1981). Gerry Beckley has also given extensively to Habitat for Humanity. Dewey Bunnell gives to Defenders of Wildlife Action Fund. He and his wife also work with animal rescue in both Wisconsin and California. They are trained birds of prey rescuers in Wisconsin and have taken a lot of injured animals into their home to rehab and have released them upon recovery.